Putative most distant object in the visible Universe, labeled z8_GND_5296. Credit: V. Tilvi, S.L. Finkelstein, C. Papovich, A. Koekemoer, CANDELS, and STSCI/NASA. The Big Bang theory dominates cosmological theories. Papovich (indeed, virtually every astronomer) bases his understanding on the major premise of the Big Bang theory: that there was no matter, no space, and no time in “the beginning”, and that for some reason, an irruption of energy from another version of existence, a “primordial egg”, replaced that emptiness with matter and energy, which began to expand and then “inflate”. The Big Bang theory was developed when the astronomer Edwin Hubble, using the 100-inch telescope at Mt. Wilson observatory, believed that he had observed galaxies receding from the Milky Way at vast distances. The most surprising aspect to his data was not recession, itself, but what appeared to be high velocities associated with the galaxies. 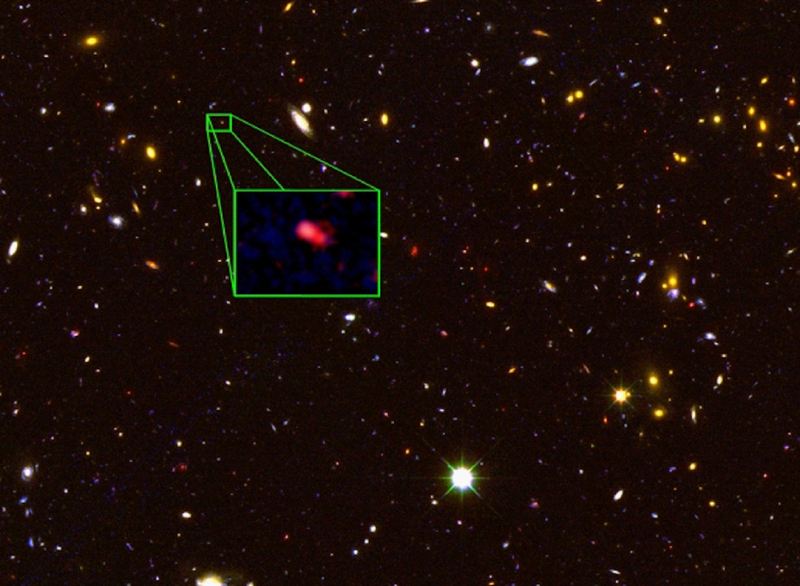 According to Hubble, some galaxies were flying away at thousands of kilometers per second. Adapting the Austrian physicist Christian Doppler’s observations to the spectra of various galaxies, Hubble thought that the change in location of particular elemental signatures called Fraunhofer lines (for the German physicist Joseph von Fraunhofer) indicated that the light had been shifted toward the red end of the spectrum by an apparent recessional velocity. Fraunhofer lines are supposed to occur at specific frequencies identified in the spectrum by the kind of element that is absorbing the light. As the theory states, if they are in a different location, then they have been Doppler-shifted because of the element’s acceleration, either towards the observer (blue-shifted) or away (red-shifted). This idea is the basis on which galactic-scale distance calculations and the supposed speed of recession are founded. Using this system of redshift, some galaxies are thought to be moving away from Earth at an unbelievable 90 percent of light-speed. 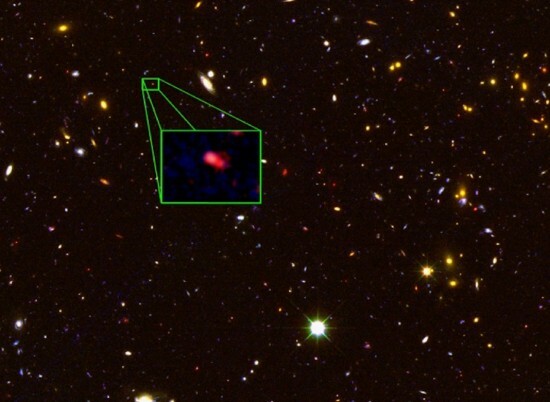 Since the theoretical distances and the recessional velocities of objects are correlated with a time-scale, a galaxy that is 10 billion light-years away is also thought to be as it was 10 billion years ago. Astronomers believe that they are seeing ancient light that has been traveling through space for 10 billion years. Astrophysicists of the recent past were perplexed when their observations indicated greater complexity in the early Universe than they thought should exist. As the principle of inflation states, though, it is not merely the expansion (re: acceleration) of the Universe that is affecting the Doppler-shifting of spectra from remote galaxies, but that the “space” in which they are embedded is expanding. If it requires a certain amount of time for a galaxy to form and the Universe is thus-and-such years old, then a galaxy should not exist at time-distances more than a certain redshift. When such formations were seen, as far as the relevant theories were concerned, “inflation” had to be added to the Big Bang theory to account for them. So, objects that appear to be redshifted at extreme distances may not be as old as their spectra suggest: they are moving along with the expansion of space. As the inflationary theory proposes, they are not as old as they appear to be, they are simply “farther away.” This dichotomy seems to demand that the early Universe was expanding faster than the speed of light. Edwin Hubble’s observations of galactic distances versus speed of recession led to another quandary: galaxies that are far enough away would move so fast that, as mentioned, their velocities would exceed the speed of light. This is known as the universal horizon, or the Hubble radius. It is the point beyond which observations can never be made, because the light from beyond that horizon can never catch up to the greater-than-light-speed inflation of space. How did these twists and turns in ideas, as well as the warping of time and space come about? They are the direct result of the assumption that redshift correlates with distance. Modern cosmological systems are all built, without exception, on that assumption. What if Hubble’s original premise was flawed? What if redshift is really a red herring? Redshift and inflation have become something of a dogma among the astronomical community, and even though many observations contradict the consensus view, and have been doing so for 40 years or more, those data are ignored or marginalized. High redshift quasars, for example, are found in axial alignment with galaxies that possess substantially lower redshift. Astronomer Halton Arp speculates that the redshift measurement of quasars is composed not of a velocity value alone, but also depends on what he calls “intrinsic redshift.” Intrinsic redshift is a property of matter, like mass or charge, and can change over time. According to his theory, when quasars are ejected from a parent galaxy they possess a high intrinsic redshift, z = 2 or greater. As the quasars move away from their origin within a galactic nucleus, their redshift properties begin to decrease until they reach somewhere near z = 0.3. At that point, the quasar resembles a galaxy, albeit a small one. The inertial moment of ejection is eventually overcome and the mass of the quasar increases, while the speed of ejection decreases, until it may become a companion galaxy. It is in that way that galaxies form and age, evolving from highly redshifted quasars, to small irregular galaxies, and then into larger barred spirals. There is nothing conclusive in mainstream scientific journals about Arp’s data. His telescope time in the United States was cut off many years ago by decision-makers who allot that time to various research groups. His revelations concerning problems with consensus dogma were considered intolerable, so he was summarily censured by his peers. However, the evidence he continues to gather and promote ought to make us stop and think: is the Big Bang dead? How big and how old is the Universe if redshift readings are not reliable indicators of distance? Just how “far away” is z8_GND_5296?